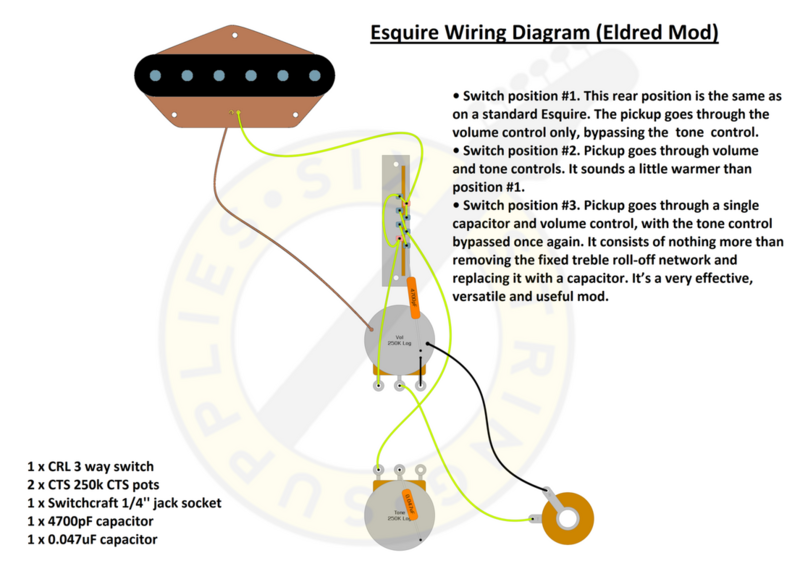 Wiring diagram for the popular Eldred Esquire mod (also known as the "cocked wah" effect). This setup makes the most of a single pickup guitar using typical Telecaster components (3 way switch, volume, tone etc...). The video demonstrates how to assemble this setup yourself. 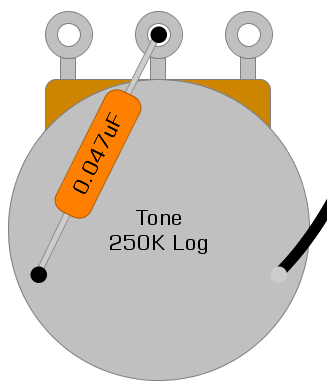 You need the typical Telecaster components with the addition of a second capacitor (0.0047uF). Switch position #1. This rear position is the same as on a standard Esquire. The pickup goes through the volume control only, with the tone control bypassed for a hotter, louder lead sound with added highs. Switch position #2. This middle position is also the same as on a standard Esquire, with the pickup going through both the volume and tone controls. It sounds a little warmer than position #1. Switch position #3 In the front position of the Eldred Esquire wiring setup, the pickup goes through a single, small capacitor (0.0047uF) and the volume control, with the tone control once again bypassed. It removes the fixed treble roll-off network and replaces it with the capacitor. This offers an extra dimension and more flexibility and gives what is popularly known as the "cocked-wah" effect. Ground lug 3 of the volume control - do this by either bending it onto the pot casing and soldering it in place or by using a little jumper wire from the eyelet to the pot casing. NOT ABSOLUTELY NECESSARY if you are using a metal control plate but sometimes it's a good idea to reinforce the ground connection between the two pots. Solder an earth wire connection the two pot casings together. Add the tone capacitor (value of your choice!) Typically single coils work well with 0.047uF caps and that is what we are using here. However you may want to experiment with a 0.022uF at the other end of the spectrum or even a 0.033uF (which is somewhere between the two). Solder one lead of the capacitor to the middle lug (output) of the tone control, while the other lead goes to ground on the back of the pot casing. Referring to the below numbering layout on the diagram, connect two jumper wires. One from lug 5 to lug 3, and a second from lug 6 to lug 2. Next - using a continuous piece of cloth wire (with the cloth push back) run a wire from solder lug 7 to lug 8, across to lug 1 and finishing at lug 4. It is possible to do this with a single length of cloth wire. Refer to the below diagram as well as the above video for reference. We now need a wire from the switch that connects to the volume control. You can do this from either of the "common" lugs on the switch (in our numbering layout, this is either lug 8 or lug 4) but as it is easier, run a wire from lug to the volume control input lug, as per the below. We also need to connect the switch to the tone control. 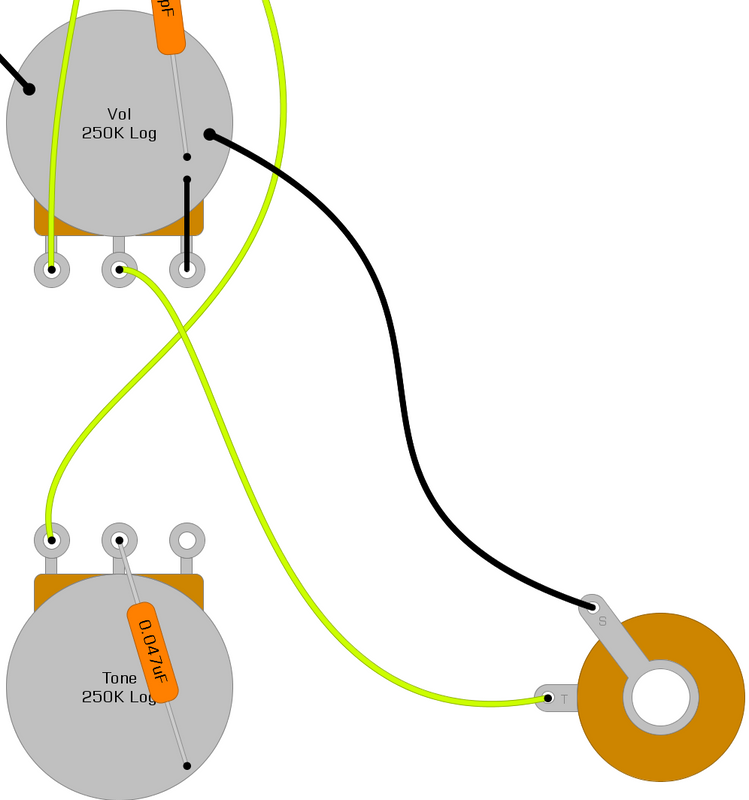 Add a wire between lug 6 of the switch to lug 3 of the tone control as per the below diagram. To complete the switch, connect the 0.0047uF capacitor to lug 5 and the other lead of the capacitor to ground (typically on the volume control pot casing. Every mono jack is the same - the inner ring is the ground lug, the other lug is the hot signal lug. 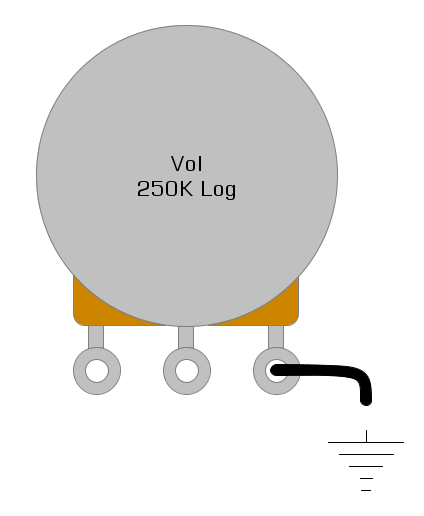 This is demonstrated using black wire (ground) and yellow wire (hot signal) in the diagram below. Thread the wire through it's respective solder lug and solder into place. Bend the wire round for a better mechanical connection before soldering in place. It is useful to cover the finished joints with heat shrink rubber tubing to create a more durable, longer lasting jack. It is advisable to twist the jack wires together (having the hot signal wire from the volume to the jack wrapped around the gorund wire, offers it a little protection from unwanted EMI. To connect the jack - solder the black wire to ground (again, typically on top of one of the pot casings, and the yellow wire to the output lug (middle lug) of the volume control. The final step is hooking up your pickup! The pickup's hot signal wire will go to the switch, its ground wire, to ground. Connect the hot signal wire to the "common" lug on the switch as per the belw diagram. Twis tthe pickup wires together and solder the ground wire to the volume pot casing.